Can the price remain this low with tightening supply? With the financial experts claiming, some gleefully, that gold has "lost its safe haven status" in the aftermath of its biggest tumble in 30 years, many commentators thought (hoped?) that the dramatic price drop would steer people away from gold ownership. To my eyes, the past week has all the earmarks of a high-gloss propaganda campaign complete with well-placed anti-gold stories in the media and the careful use of language aimed at sowing doubt about gold's ability to be a store of wealth. But for those who consider gold a store of value, the recent gold slam is a gift: an invitation to purchase more sound money with fewer units of paper currency. In other words, a sweet deal. Gold and silver on sale and the world is taking advantage. I predicted this last Friday, when I wrote, "[k]nowing the lower prices will only exacerbate this West-to-East flow [of gold], I therefore thought that the bullion banks and central banks would not have dared push that dynamic any further." Well, by all accounts, the flow of gold from West to East is now accelerating. Bullion tumbled 9.1 percent yesterday, the biggest loss since 1983, and that may make the precious metal more affordable to Indians, said Mehul Choksi, chief executive officer of Gitanjali, the nation’s biggest retailer of jewelry and diamonds by sales. The plunge has already revived interest among retail buyers, said Rajesh Mehta, chairman of Rajesh Exports Ltd.
Doh! Unintended consequences are piling up already, as people in India gleefully accumulate more gold at lower prices. The Perth Mint reports that retail customers are increasing purchases at a record rate even as gold slumps to a 21 month low. As the experts were proclaiming the "Death of Gold", the Perth Mint website recorded the highest activity of the year and one of the best days of the past year. Bargain prices on gold and silver have greatly increased the demand for physical gold and silver by the public. Demand for gold coins have [sic] skyrocketed with sales of Australian gold bullion coins increasing by 48% in the first quarter over the comparable prior year period. (Reuters) - When he woke up to news of a collapse in gold prices, Yujiro Yamashita, 63, made his way to Tokyo's posh Ginza district to buy the precious metal for the first time in 20 years. Yamashita and other contrarian, individual Japanese investors understand that gold is a volatile investment, but say that buying the precious metal is better than the alternatives. A week ago, as the yen-denominated price neared a new peak, jewelry stores and gold merchants across Japan saw long lines of mostly older Japanese looking to cash in on unwanted jewelry and other items that they had held for years. Nearby at Ginza SGC, a gold merchant, buyers had taken about 6 kg (13 lbs) of gold home by early afternoon on Tuesday. In one case, a 60-year-old man, who asked not to be identified, walked out of the store with 500 grams of gold for about 2.2 million yen ($22,500). Meanwhile, the Chinese and Thai, too, are rushing to buy gold as a consequence of the new, lower gold prices, with high sales volumes and shortages being widely reported. So this is a fairly large story that can be summarized in basic Econ 101 terms: Supply, demand, and prices are all interrelated. Drop prices and demand increases, which then lowers supply. In the U.S., all of the dealers I talk to are reporting huge demand and brisk buying. Silver in any form is quite hard to come by unless you want to pay premiums of 20%+ per ounce above spot price. Delivery times are 5 to 6 weeks out now – that's an unusual situation. If this recent slam was designed to scare people away from gold, it did not have that desired outcome; in fact, just the opposite. There were numerous oddities in the timing of the gold and silver slam of the past week, and among them were two notable developments in the supply chain. Recall that the gold and silver carnage began on a Friday morning (4/12/13). 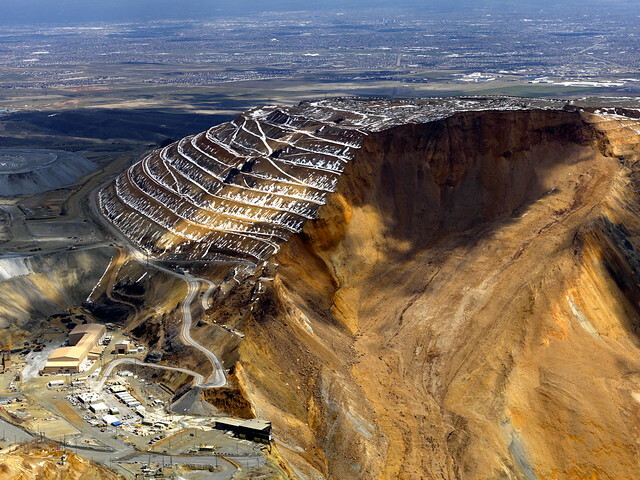 Bingham Canyon produces some 400,000 ounces of gold and nearly 3 million ounces of silver on a yearly basis as byproducts of copper mining. It will be several years before the mine is back up to full operating capacity. Normally, the news of a major mine being taken off line is a bullish sign for the associated commodity, but not in this case. On that same Wednesday gold and silver both went down in price. So the market completely discounted the news. Coincidentally, also on Wednesday (4/10/13), the Chilean supreme court suspended Barrick Gold's Pascua Lama mine over a variety of environmental and social concerns, and that project got relegated to years of litigation. This is a huge mine project with probable reserves of over 18 million ounces of gold and 700 million ounces of silver. It is now completely halted and will remain so as lawyers battle things out in a process that most think will be several years long. So current and future production of gold and silver took hits last week right before the big price drops. Perhaps this is just a very strange set of related events, but the incongruity and timing cause me to lean towards what Robert Di Niro said in the spy thriller Ronin: There is no such thing as coincidence. At any rate, whatever the case may be coincidence or not, future supply of gold and silver will be lower than we thought as recently as Tuesday of last week. There has been a lot of speculation about why gold was hit so hard. The theories range from it being "just one of those things" (i.e., normal market behavior) to an orchestrated attack to drive down the price of bullion. I happen to fall into that latter camp and summarized my thinking in why gold is being attacked in yesterday's report, This Gold Slam is a Massive Wealth Transfer from Our Pockets to the Banks. An important question to ask in the face of such attacks is cui bono? Who benefits from dropping the price so dramatically and breaking faith in the precious metals as a safe haven? The Internet is swirling these days with rumors of a near inventory failure at the LBMA (London Bullion Market Association), a 'too big to fail bank' of a large sovereign country in Europe that's teetering, that needed protection against its derivative exposure. One of these could be true – perhaps all of them might be; I honestly don't know yet. We have imperfect vision into markets these days, and these are each developments that the central powers would be doing their utmost to shield from our view. But there's certainly a lot of smoke in the air surrounding the precious metals, and as the adage goes, where there's smoke, there's fire. In Part II: Why There May Be a Lot Less Gold Than We Realize, we explore a particularly interesting possible reason for the suppression of the precious metals. A recent report issued by Sprott Asset Management calculates that the U.S. has silently exported a massive amount of its gold reserves over the past two decades. If accurate, it puts the long-term manipulation of the gold and silver markets into context. And it gives a reason for why breaking faith in the precious metals at this time would be an important objective. In addition to the huge dimensions of the pit, I was struck by how much energy was being consumed before my eyes. Not just by the trucks and the diggers, but in the refining process, as well. The ore being mined looks like simple rocks, the copper and other metals within in the ore are in such trace amounts that you can't see them visibily. A tremendous amount of energy is expended to coax out and separate the desired metals in commercial form. What I take from this is that it's going to take a LOT of additional energy to get to the remaining ore now buried under the landslide. The stoppage in production at Bingham Canyon, plus the incremental energy now needed, can only put upwards pressure on the price of domestic silver. I agree, There has been an increase in the number of the "We buy gold and silver" brigade around my way just recently, and that was before the smack down in price. Always a good sign. Just went to my local coin dealer. He sold me a small amount of gold for a reasonable price above spot. He is not selling any silver besides collector coins. What silver he does have is not being sold because of what he paid for it. In over thirty years in the coin business he has never seen anything like it! More info. Have you tried to buy a mid grade safe lately? In my area they have been on back order for over five months. This is what we call a, "leading indicator"
...it's the pants of the financial industry! Liar liar pants on fire! My son-in-law works for Rio Tinto the company that owns the Bingham Canyon Mine. He has told us that there is much more damage to equipment and infastructure than is being reported. They currently are still producing metals at the smelter but only for another few weeks. After that they are expecting to be at only 50% capacity the rest of this year. That is a lot of copper, gold and silver that are not going to be coming out of the ground this year. I work for a engineering company that specifically designs gold/silver processing plants. We have been very busy over the last year. With the price of gold as high as it was, many low grade mines could spend the capital to go into production. There is a point that if the price goes to low many of these plants will be shut down, it will no longer be profitable to mine such low grade ore. This will further enhance the shortage spoken of. The unintended consequence of all this banking system and corporate fraud that is going unprosecuted by the Obama Administration - contrary to what he promised to do in 2008 when he was campaigning - is that a larger cross-section of the American public are starting to catch on to the game being played by the banking and political elite. Yesterday's gold sales by the mint is proof. Local coin shop just shut down for the day. Sold out of Ag & Au. Owner is "heading off to the bar" (sic). The first phase is the accumulation phase. The item is dirt cheap and only smart money is buying. The public has no awareness at this point. The second phase is the awareness phase. Seasoned professionals buy and the public becomes aware. The third and final phase is the speculative phase. The public gets involved and panic buying sets in. Prices go exponential. I'm not a chart guy, but I feel that this most recent knock-down will usher in the third and final phase. Many folks at work have mentioned gold and silver to me, so their financial involvement is right around the corner. What I keep telling myself is that PM's are how we safely transport today's Monopoly money to tomorrow's productive assets. I'm more focused on tomorrow than I am on today. I had dinner last night with 2 old colleagues that I hadn't seen in a couple of years. We spent the first part of the evening on the subject of gold. They asked me if I am still a "gold bug" and how I felt about the bubble bursting ... after a brief soliloquy of my observations, the conversation meandered to other topics. It circled back to gold/silver (not due to me) at least 3 separate times. They're not as optimistic as they used to be. The economic situations in euro-land, Japan, and here in the US have them concerned. Both primarily get their news from MSM and NPR. Both think shale oil will make us energy independent. They're split on global warming consequences. Both think the government should stimulate more to get us out of this recession. I see the buying of PM down here by retail as an encouraging sign. If "the world" sees this as good stuff at a discount rather than buying the story "the gold bull market is dead", it could be a pretty lethal bounceback. I would encourage everyone to not only find the "good gold news" but rather the "bad" gold news too. Try and smoke out the truth from the barrage of "goldbug cheerleaders" articles as well as the MSM's well-spun story suggesting gold is finished as an investment vehicle. I don't trust either of them. We should also tune out the LBMA failure rumors, manipulation stories, and the like. If those other central banks and real people around the world treat this like a sale, the futures markets will respond soon enough. They have no choice. I really like the stories from individuals here who have gone to coin stores and found them empty of gold. That's the kind of stuff I like to hear. Not articles from kitco or KWN, which is all gold all the time. Some other thoughts: Soros sold his gold back in December, I think it was. He told people a few months later. When he starts buying, he's not going to tell anyone. And he'll do it slowly, so he won't move price too dramatically. But his buying will be visible in the price charts. Dips will be bought, rather than rallies sold. Deflation is still out there. Until the eurozone changes policy - IF it change spolicy - they will be a drag on the worldwide credit market, which will likely pressure gold and especially silver. A gold-positive outcome would be any nation that decides to leave the eurozone (and then promptly print money), an ECB policy change to monetize eurozone debts, or moves to restrict capital flows between any of the major nations. But until any of those things happen, Europe's deflation will be a drag on the price of gold. My goal here is to see the future as clearly as possible, rather than searching out stories to prove myself (or my faith) correct. If nobody can get gold because its all sold out, thats some great information. Meantime I'll be looking for clues as to levels of support in the futures markets. Right now, the rebound is proceeding; there was a successful test of the lows (1334) in Asia thursday which has resulted in a really impressive move up to 1415 right now. My recipe for a successful rebound would be a slow and steady climb, a series of higher highs, followed by a breakout at 1565, with the shorts being squeezed the whole way up. Those are the footprints of Soros (and people like him) accumulating slowly. If you're a chart watcher, look for those long legged daily candlesticks where the market keeps probing the lows, and they keep being bought. A big smash like this has the potential to clear the decks for a big move higher. But stories won't do it - only the market's reaction to the smash will tell us how things will unfold. So far, it's positive, but rather than faith-boosting, we need to see events as evenhandedly as possible so we can ascertain where things will move next. To that end, I would encourage everyone to avoid seeing this as a football game where "your team" scores with every gold-positive news article. Really look for the truth! We cannot "urge the gold market higher", its way too big. All we can do is try to figure out what its really doing, and take action based on the information we collect. I'm long gold too; I have a vested interest in knowing the truth. I completely agree with all of this. The thing that most has me ready to run out and buy gold and silver with both hands is the degree of physical tightness in the retail market in the US as evidenced by lack of supply and blown out premiums (as high as I have ever seen them), as well as the rest of the world's buying spree. One of the things I was waiting for was a breakdown between the paper price and the actual, physical price. Even here we might note that the premium on well-respected funds like PHYS and PSLV are negative(!) while the premium on actual physical is quite positive. This indicates to me that people are preferring the real stuff over all abstractions - a bird in the hand is worth more to people than one in the bush - even ones as well run and tied to a trustworthy custodian like the Sprott funds. Now, all of this could be over in a few days or weeks as people calm down and prices normalize, but it shows that with even a slight amount of increased buying pressure the physical network in the US can be completely tapped out. The only thing that could remedy that would be much higher prices which might convince a few folks to begin parting with their stashed metals. All said, a disconnect between the paper and physical markets is one of the signs I have been waiting for for a long time. This might be it, but it's not severe enough for me to say "this is it!!" However, it is most decidedly a very interesting development. It is really interesting to see how people on the street are reacting...that is going to be my real barometer - not what gets reported in the news. Today - local coin shop owner stated that he's never see it like this before (seem to remember comments like this at the local PDW shop over the past several months). He's not selling "anything that doesn't come in the door first", and little is coming in. Best estimate on delivery of existing orders is ~5 weeks, and he is not taking any new orders at this time. He mentioned that some dealers are going ahead and buying from other dealers (bypassing the mints?) to cover their existing orders (as a way to limit exposure to possible volatility). That was on silver bullion, so the premium would amount to about 5% by my calculation. My coin dealer happily sold me silver eagles on Monday for spot + $3/coin premium. I had to wait two days. Today he's had to raise his SAE premium to $6.50/coin and told one customer, "This is insane. You might consider waiting until the premiums go back down." Are they really "Awaiting Stock"? Or are they hoping/waiting for the price will increase so that they are making more profit on the the price they bought them in at before the recent drop? The articles and comments about when people say "I've never seen it this busy before" generally make me cringe. Those comments are by themselves meaningless. I don't care if a guy has been in business for 50 years, the recent history of gold or silver buying is really irrelevant to the prices, availability, or premiums. They are also not indicative at all of future pricing or availability. Most art has a better supply chain. And many on-line dealers aren't a whole lot better. When you start seeing coins offered at banking institutions and a far better means of exchange, then MAYBE you can make some indicative observations about supply/demand fundamentals. Now, by no means am I saying not to buy either of these commodities, as now could be as great as time as any. Just please don't ramp up rhetoric on speculative items like these and expect those judgements to be of any relevant value. I can find you just as many people not to say buy gold now, both famous personalities, and unfamous more obscure personalities, as I can say TO buy gold now. And again, as always consider the source. Just like Bill Gross of Pimco repeatedly is accused of "talking his book" on bonds, so are every other marketer and seller of every other good on the planet. As far as I am concerned, I treat every article as if the words are coming from a whore. With these currency "wars" and manipulation, everything on the planet is considerably mis-priced, and relative to time, no one has any idea whether everything could get a WHOLE LOT CHEAPER in the near future. The environment right now, is like buying clothing at a Kohl's. You often see mark downs of 40 to 50%, then they have a 'sale" offering another 30%, and then on top of that, they'll offer the exact same stuff with cash back coupons. You'll thus have an item that you thought was a great deal, having an original price of $100, then after all is tolled, ends up being $25. Was it really a great deal at $50 ? Would it have EVER sold at $100 ? Just like retail, markets all over the world are so totally distorted, if not corrupt, there isn't a price right now for anything that is low enough to be of a "true" value, and most people wouldn't even recognize true value, because the US and much of the world has been living in such a heavily manipulated environment for more than 30 years now, and we have lost all perspective for purchased goods. As I accumulate gold or silver right now, my current highly skeptical view, is that I am equally at risk of the price dropping to 20% of what I bought it at, as I am of having it appreciate to 5 times what I am buying it at. Its a HUGE RISK, either way. But the same can be said for holding dollars, keeping money in ANY bank, or buying any product. In otherwords, if you truly cannot afford to "lose it" then you truly shouldn't be buying much of it. After the Boston bombings, and many other incidents in recent months, if you can't accept the premise that our entire world is a total crap shoot, then you'd be best to go into lockdown and hunker down mode, and come back up when the sun shines permanently again. For all intents, we are living in what used to be referred to as the Wild Wicked West, back when there were barely any laws, any sheriffs, and you fought for your survival nearly every single day. I have absolutely no clue whether gold or silver will provide ANY sense of security or means of economic survival. None. Its only a hunch, and its one of many several different bets I am making. Anybody who says they know otherwise, and are supremely confident about their prognostications, you need to run from, big time. They dont know any better than you do. No one can, in this environment. I have to tell my wife, rather often, that these are just all bets. There are zero guarantees. I think she gets that now finally. If we lose it all, economically speaking, we have to start over. Like anyone else would. And we may not be able to do a damn thing to prevent any of the financial chaos from occuring and then ultimately affecting us. No amount of "prepping" is a guarantee of anything, and actually might be an adverse thing to be doing, depending where you live, and how others around you react when or if the SHTF. We dont own guns either, and I am fully comfortable with that. Sometimes the best defense is to be as low under the radar as humanly possible. In fact, the best off, may be the folks who dont have any connection to the internet, credit cards, yet live right next to a nuke plant or in the midst of a heavily populated city. For those that didn't hear about CBS-Canada's show on gold last night here is the video. You might want to download them because they'll probably be taken off youtube soon. I am curious. Control S does not save this video. Let us see how long it stays up. I think the clip right at the begining of the video where Moses the Lawgiver smashes the tablets because of the worship of gold illustrates my position. Hitler melted the Jews down for their gold content. I repeat. Gold is for Kings. I wonder how the transmutation efforts at Mitsubishi are going? I do know that they are transmuting calcium. Will the Kings allow transmutation? Would they insist on it? Gold is just another element on the periodic table. To be certain it has artistic virtues. I would like to see enough of the element so that that is it's only attraction. Scotiamocatta, one of the few institutions on the LBMA, is hardly a small player. If there are indications from the staff of a major bullion dealer like this that there are some supply issues, then I think that is something to make note of. As far as I am concerned, I treat every article as if the words are coming from a whore. This is in really poor taste, and I think you can find a better way to say what you want to say. We are striving for a higher standard on this site and I for one find that a bit on the gutter side. No need for it to make a point. You otherwise make some good points here and there. There is no need for herd mentality or head for the hills and hide because it is doomsday. Each of us is different, and one person's "deal of the week" is another person's "high risk purchase", just as one person thinks "the world is a total crap shoot" while another thinks it is the garden of Eden. The point is to find the balance in between all the good, the bad and the ugly, and yes, flying below the radar by not living one's life on either end of the extreme spectrum is always a good thing. So on the one hand you acknowledge the danger of holding your savings in dollars... and then in your last sentence, you say that, if you can't afford to lose it (meaning the buying power, right?) then you shouldn't be buying much of it. This is internally inconsistent advice, because by taking the advice you give in the last sentence... i.e. not buying "it", then you are staying in cash. And cash is also risky, right? Your last sentence is twisted.. it says that, in effect, if you cannot afford to "lose it" then you should stay in cash. That is BS, because cash is the only place you can lose it ALL. It seems to me that the purpose of your post is to scare folks out of PM's and to make the case for cash in an offhanded way. The fact is that paper money can and has many times over history gone to zero. Gold and Silver will never go to zero. Which is more risky, really? The thing that can go to zero, or the thing that cannot? Supply/demand fundamentals? When the Federal Reserve Bank of New York can't deliver Germany's gold in 1 week we already know about the fundamentals. Germany demands gold. Federal Reserve of New York has no supply (7 year delivery = no gold) Anyone paying attention has connected the dots. Gold and silver generally move together, but they tend to move at different rates. One way to look at this is through the lens of the gold:silver ratio. Currently it stands at 60.50; that means it takes 60.5 ounces of silver to buy one ounce of gold. At the beginning of Feburary 2012, that ratio was 52. In May of 2011 when silver hit its peak of $50, the ratio was about 32. So as PM has fallen, silver has fallen further, and recovered less than gold. In this week's Weekly Metals Wrap at KWN, Bill Haynes described the level of metals purchases at his PM business: gold buying outnumbered silver buying by a factor of 3:1. This is unusual, normally purchases run about 1:1 - on a dollar volume basis. Judging from the rebound of the two futures markets, this has borne itself out there as well, with gold's rebound looking substantially better than silver's. Some numbers might illustrate this: gold dropped $239 and recovered $86 [36% bounce], while silver dropped $5.70 and recovered $1.23 [22% bounce]. Silver's bounce has absolutely been more anemic. Gold's chart just looks better as a result. It is normal to have some kind of rebound after a fall like this; the key test comes once upward movement begins to slow down. Shorts see an opportunity to sell again and that's when we see if the demand at these levels is strong or not. Based on the recent price movements, I see a danger in silver that it could go lower. That danger is less with gold, in my opinion. I base this on a healthy gold trading market in Asia (India, China, Hong Kong, Thailand) as well as that gold:silver buying ratio from Bill Haynes. There appears to be more buying support for gold than silver at this moment. Many people in asia treat gold jewelry as a form of savings. Take Thailand. You can take a gold chain that you bought (or were given!) for 19,500 baht and if you return it to the same shop, you will receive 18,700 baht back - only a 4% haircut. That's less than the premium on a US Gold eagle!! Gold bars are even more liquid - the haircut is only 0.5%. In Thailand, gold may not be money, but its definitely seen to be a culturally acceptable form of savings. The spreads are set throughout the day, nationwide, by the gold trading organization. I'm guessing the words "sold out" on the following page indicates the current level of demand at the wholesale level on Friday. To give you a sense of perspective, the Gold:Silver ratio peaked at 82 in the 2008 crash and bottomed at 32 when silver hit $50, so the value of 60 right now is in the upper range, but not near the peak. It could definitely go higher. Something to keep in mind in order to set your own expectations about how the various metals perform both in relation to each other, and also vs the dollar. It can help you to understand "why my silver is doing so poorly" and conversely, why it did so incredibly well in 2011. Interesting documentary, although most of what they discuss has at least been speculated upon around the internet for years. One point of fact. The documentary states that when FDR "confiscated" gold, the owners were paid $35/oz. As I understand that incident, owners were paid the going price, $20.67/oz at the time, and the price was raised to $35 after the fact. That one fact probably doesn't have a lot of meaning on the overall allegations of the documentary, but small errors of fact always raise suspicions about motives and truth of the rest of the facts. This may be true, but I would note here that silver product disappeared fastest and more completely than gold during the post-slam buying spree. Silver is by far 'the more rare' of the two PMs in dealer inventory right now. That's why the physical premiums are so much higher for silver. Your second point that silver has rebounded less vigorously is true, but that's paper silver, not physical silver. I remain cautious about reading the paper markets signals as being the right ones, as I think they are grossly distorted by all sorts of factors, not least of which is the dominant presence of a group of large players that have figured out how to repeatedly make money via bear raids that have all the hallmarks of being coordinated, collusive, or whatever term you prefer (whether or not the signals to guns the stops are actually communicated using words, or are simply transmitted by watching the tape). The day that I have long predicted, is the day when the paper market for silver (or gold) is flashing us one signal, but the physical market is flashing another. We might be there...or at least we are close, the next couple of weeks will tell the tale. Either physical silver availability increases while premiums decrease, or conditions remain tight and high, respectively. If the latter, then I would expect the paper shorts to really double or triple down to see if they can scare even more people away from physical. If they fail at this, the price explosion should be substantial while physical availability plummets until prices are high enough to release some of the private holdings. A personal moment of frustration will ensue for me if during the price explosion the CFTC once again comes to the rescue of the silver shorts by changing the rules in such a way as to benefit the shorts and limit the gains of the longs. It won't surprise me because that's the sort of rigged universe that we happen to live in, but it will annoy me, as it should everybody. Let's hope I am being entirely too cynical on that front, but there's nothing in the recent past to indicate that I have slipped too deeply into jaded territory. We'll see. In the meantime, I will just restate the most important point which is that even just a little bit more buying than usual was enough to completely strip the silver shelves bare at the retail level, and so we might ask ourselves what would happen if/when even 5% of the population decides they want to own some physical silver? Premiums are a good indication of that divergence you talk about. The channel for obtaining physical silver takes about 30 days. If the COMEX refuses to cough the silver up, you can always buy PSLV and take delivery of your PSLV shares for about $0.50/ounce - minimum 10,000 ounces. Schedule it on the 12th, receive it on or about the 10th of next month. So if premiums are too high, they won't stay high for long - either that, or those premiums will be transmitted straight through to PSLV. http://sprottphysicalbullion.com/media/1397/Sprott-Physical-Silver-Trust... - see page 55. So for me, one signal for the long awaited, much talked about, but never seen Commercial Signal Failure - the holy grail of all silver owners - may be signaled first by the blowing out of the PSLV premium to NAV. Its the only place that I know of that guarantees to deliver silver on demand for a small premium. At one point it was 20% a few years back, but now its trading at a slight discount. Perhaps that's the real bargain. It will take some weeks before all this sorts itself out. By all means let's watch the premiums and see where they go. But I for one won't be surprised if the price of silver futures drops further. I'm not betting on it, but I'd say its 50-50, and it largely depends on how the rest of the commodity complex fares. Copper is looking bad, the buck is rallying, the long bond is moving up, and if this pressure on commodities continues I believe silver will retest 22, and I'm not sure 22 holds. I know we sometimes tend to look at PM in isolation, but they are really just players in a larger game, and sometimes that larger game ends up driving the direction of play. Almost a 60% haircut , tax , confiscation . Call it whatever you want. The government is very hungry!!! In your own myopic and naive little world, you'd probably only think cash versus gold. What I am saying, and there is no inconsistency whatsoever, is there are absolutely no guarantees in life. If you are foolish enough to believe that one currency (gold or whatever) versus another is going to help protect you, then you deserve to have your head handed to you on your plate. I do go over the top sometimes when I sense someone is espousing the paperbug position. I guess based on your post I was smart to spend the day at the range.. the new Mini-14 is still having failures to extract way too often.. it may need to go back to Ruger. The HiPoint .45 carbine was sweet, but I still like the 9mm version better as the mag's hold 10 instead of 9, and for some reason you have to engage the mag release button on the .45 to get the mag in, while on the 9mm version you can just smack it in, leading to much faster mag swaps. As long as there is paper that can be bought that supposedly represents a commodity, that commodity can easily be manipulated by the ones controlling the printing of the paper. How long can the price of gold stay down?... ... Forever! As I watch metals futures trading today, I'm struck by the continued relative weakness in silver. As an example, both gold & silver are down in afternoon trading in asia; gold is off -0.46% while silver is down -2.31%. The charts of the two just look different too. Lest you feel the urge to blame those pesky manipulators, copper is off -1.34%, oil down -0.90%, platinum down -1.43% and palladium -0.95%. It will be a good sign for silver when the gold:silver ratio peaks and starts to reverse. Until then, I think silver will do poorly. Since I have long silver positions this outcome is not something I want, but its something I must consider. The good news: you might be able to get your silver at an even bigger discount soon! Who buys the short positions? Martin Armstrong has been making some blood-curdling forecasts for gold to possibly sink into to three digit territory. Be that as it may, he also raises in his "The Myth of the One-sided Trade" blog entry the point that for every seller of a short position on the PMs there is a buyer implying that selling naked shorts therefore is not necessarily bearish for PM prices. I am surely missing something but does he have a point? Who is buying all of those shorts and what should the impact be on the gold/silver price? (naked) shorts are just pretend supply that does not exist. The entire market structure today, including price, assumes that much more Gold and Silver exist than is actually the case. Thanks, Jim H. I was hoping you could enlighten me. My understanding of the futures markets is thin. I understand that naked shorts are not backed by actual gold/silver holdings but to enter a short futures position, naked or not, isn't necessary to sell the futures contracts to a counterparty? If so, who would the buyers be of the huge naked short positions? Could the bullion banks be the buyers and the sellers, willing to take a small loss on the long positions knowing they will recoup it on the short positions? Martin Armstrong is very dismissive of the wailing about naked short positions on PMs so I am curious to know if he has a point or not. Its only been one day, but today the gold silver ratio appears to be improving, from the point of view of the silver bugs anyway. Any time silver advances faster than gold at least in recent years, it is positive overall for PM, and this is the first day this has occurred since The Big Gold Crash. Its not 100% accurate since GLD and SLV both don't track gold & silver exactly (JPM has to make money somehow) but its pretty close and will give you a good idea. If you watch these guys, they all tend to move together - not at the same rates, but generally in the same direction. If oil drops, likely - so will silver. That's why I say gold (and silver) both trade like commodities to some significant degree. Sometimes gold diverges, but mostly, it tracks. Nothing like having physical...but I find the whole virtual currency idea and the appeal of bitcoin fascinating. Sure something is burning. The banks and the government can’t see gold, or anything for that matter, get more attention than their dear dollar. They are using every possible trick in the book to smack down gold and have the spotlight back on dollar. However, this may Backfire….